Nice theory, but I'm still sticking to story that we all know. Kaden was killed (or maybe cheated death) after fighting Tachyon. 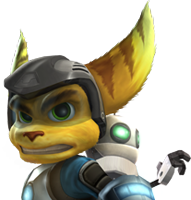 Ratchet doesn't look like Azimuth. The muzzle, eyes, fur color. He looks more like Kaden. Guess it's up to Insomniac to tell us the ultimate truth. Yes I agree. I think that the ratchet 50's theory is impossible. At the same time, he is a Breton, and we must not blame him. So, I would like to know if Kaden is alive. When Tachyon says he "destroyed" him maybe he just destroyed him morally. He may have killed his wife in front of him, or thinks Ratchet dead too. Uh, what's wrong with being a Breton? Sorry, I know nothing about French humor. Finally I have a theory. You never noticed that everybody fights the balls of the daronne of Ratchet ? Kaden, Alister, Clank, everyone does not care. Finally Alister and Kaden must be an LGBT couple, long live to gestation for others lombax. I think we should stop with this whole Kaden x Alister or Ratchet x Alister thing. Leave the dead men's souls in peace. I still believe Alister's version of the whole story, as there were nobody else to tell the story in the game.